It's not difficult to connect to the Internet via Wifi in France. It's also not difficult for a hacker to steal your passwords. A Virtual Private Network protects you. A Virtual Private Network (VPN) is a way of making your connection to the Internet secure against hackers when you are traveling. When you login to the Internet from a hotel, apartment, café or transport terminal, your connection may be vulnerable to hackers. They may be able to see or record everything you send and receive, including usernames, passwords, credit card and bank account numbers, etc. A Virtual Private Network (VPN) makes it much more difficult, if not impossible, for them to hack you. It works for any type of computing device: laptop, tablet or smartphone. 1. You register with a VPN company, download any necessary application or app software, and arrange for payment. Most companies offer basic service for free, and more robust services for a reasonable fee. 2. When you login to a "foreign" Wifi network (that is, a network that is not your own home or office network), you start the VPN app, it encrypts your transmissions and connects you to one of its own servers. Then you have a special, separate, private "pipe" through the Internet directly to the VPN company's server, a pipe that is used only by you, a pipe that a hacker cannot see or enter. Everything you send and receive along the VPN pipe is encrypted, so even if hackers could see it, it would just look like gibberish. 3. Most VPN companies maintain servers in a variety of locations and countries, and may allow you to choose which location or country you use. For example, you may be in a foreign city, but by connecting to the Internet via VPN, the Internet will believe that you are connecting via a server in California, or Germany, or the UK, or some other location. Internet connections may be slower when using a VPN. If you notice a slower connection (you may or may not), you can always decide to use the VPN for sensitive information (usernames, passwords, credit cards, banking) and use the simple "foreign" Wifi connection, which may be faster, for simple web browsing of non-sensitive websites. Virtual Private Networks have other characteristics: they can sometimes route your connections around barriers erected by some companies, organizations and governments to limit access to particular websites and services. Also, some companies and websites limit access to their content to a certain political or economic area (a country, or list of countries). For example, if you are a registered user of a movie, video or music service in your home country, when you attempt to access the service from another country, the service may not allow you access for distribution reasons. A VPN, which allows you to login to the Internet from a server in your home country, makes it look as though you are still in your home country, and eligible to use the service. 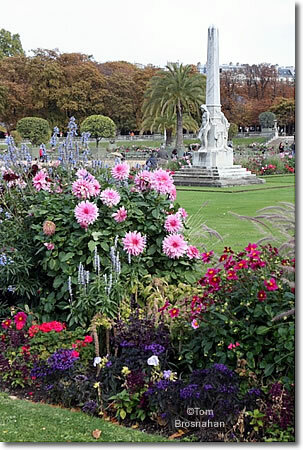 Jardin de Luxembourg: if there's Wifi, is it safe? Only with a Virtual Private Network.